Faruqi & Faruqi Law Blog: Faruqi & Faruqi Alert: Iconix Brand Group, Inc.
Faruqi & Faruqi, LLP, a leading national securities law firm, reminds investors in Iconix Brand Group, Inc. (“Iconix” or the “Company”) (NASDAQ:ICON) of the August 24, 2015 deadline to seek the role of lead plaintiff in a federal securities class action lawsuit filed against the Company and certain officers. A complaint has been filed against the Company in the United States District Court for the Southern District of New York. The complaint focuses on whether the Company and its executives violated the Securities Exchange Act of 1934 during the period between February 20, 2013 and April 17, 2015 (the "Class Period"). It alleges that the Company: (a) underreported the cost basis of its brands; (b) and engaged in irregular accounting practices relating to the booking of its joint venture revenues and profits, free-cash flow, and organic growth. 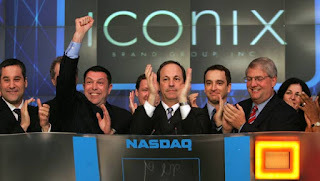 On the evening of March 30, 2015, Iconix announced the resignation of Jeff Lupinacci, its Chief Financial Officer. Following this news, the Company's shares fell $2.72 per share, or 7%, to close at $33.67 per share on March 31, 2015. Then, on April 17, 2015, Iconix announced the resignation of Seth Horowitz, its Chief Operating Officer, who had served in the position for approximately one year. Finally, on April 20, 2015, Roth Capital Partners published an Equity Research Note, stating that there were "uncertainties surrounding [Iconix's] prior reporting of free cash flow and practice of booking joint venture gains as revenue." Following this news, Iconix's stock price dropped $6.62 per share, over 20%, to close at $25.41 on April 20, 2015. If you invested in Iconix stock or options between February 20, 2013 and April 17, 2015 and would like to discuss your legal rights, please contact us by calling Richard Gonnello toll free at 877-247-4292 or at 212-983-9330 or by sending an e-mail to rgonnello@faruqilaw.com. Faruqi & Faruqi, LLP also encourages anyone with information regarding Iconix’s conduct to contact the firm, including whistleblowers, former employees, shareholders and others.